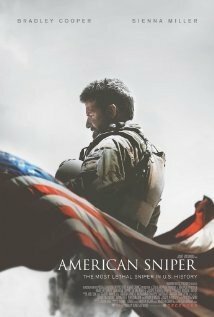 Never debating America’s ‘boots-on-the-ground’ deployment policy in Iraq , AMERICAN SNIPER (2014) starring Bradley Cooper, Sienna Miller, and Kyle Gallner is more of a character study of the Navy SEAL who made history as the most lethal military sniper ever, credited with over 160 documented kills. Although punctuated with plenty of gunfire and subsequent blood spatter, AMERICAN SNIPER is at its best when our hero is fighting to maintain his sanity stateside between tours of duty in Iraq. Based on Chris Kyle’s autobiography titled AMERICAN SNIPER: The Autobiography of the Most Lethal Sniper in U.S. Military History, this story gives us vivid, firsthand accounts of Chris’s life before, during, and after his tours. Having grown up in the heart of Texas cattle country, Chris Kyle finds himself dissatisfied with his limited future as a rodeo cowboy and decides to join the Navy SEALS after repeated terrorist attacks ignite his homegrown patriotism. His natural ability and pinpoint accuracy with a rifle become legendary, saving countless lives of soldiers throughout his 1,000+ days of deployment in-country. Traumatized by the duties of a military sniper, Chris fights his most serious battles when attempting to reconnect with his wife and young children during his rotations home. Although the SEAL Creed of ‘Leave No Man Behind’ can be a daunting task for any soldier, a sniper’s firsthand view of the enemy’s face can have an even more damaging effect. When the scope focuses in on a target carrying grenades or touting a ground-to-air-missile, it does not matter if the target is a ten year old child or a pregnant woman. They are still targets to be removed by the sniper’s bullets, and failure to do so will immediately be paid for with American lives. Directed by Clint Eastwood, Rated-R, 132 Minutes, Action, Biography, Drama. ****4 stars out of 5.